Bench advertising is simply one of the most effective, efficient forms of local advertising available today. It compares favorably in value to every other type of branding method, which is why it is simply the best investment that your company can make on a limited budget. 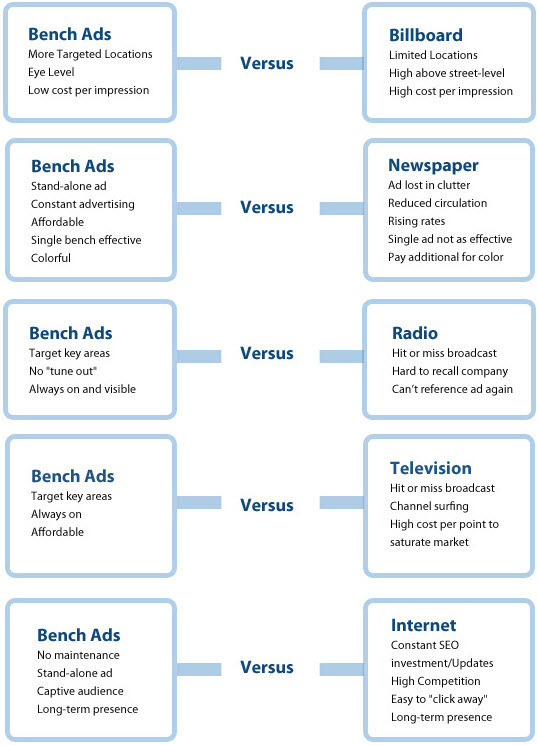 If you are interested in learning more about bench ads and bench advertising, in addition to the chart above,below you'll find a detailed comparison of other types of marketing and the advantages that bench advertising has over all of them. Untargeted, with many non-local viewers. Unlikely to receive any immediate phone calls. Are targeted to specific local locations. Are easy to read at eye level. Cost significantly less per impression. Bench ads also have the possibility of becoming immediate business with more time per impression and more information and details visible. Bench advertising is simply a better option. Most ads are thrown away. High cost, especially for large ad space. Only relevant for newspaper demographics. Your ad is always visible and can't be thrown away. Your ad shows up every day for one low rate. Your ad receives far more impressions. Your ad can be as colorful as you want for no additional cost. Bench advertisements cost significantly less every day and provide considerably more value than newspaper advertisements, while also hitting a wider market and improving your ability to reach potential customers. Radio advertisements tend to have a limited market and a significant cost. Most people turn the channel when a commercial comes on, and there is no visual branding for people to recognize your company or business in the future. In addition, if they want to call you, there is no way to rewind. They are more affordable, and they are always on – 24 hours a day, 7 days a week. Television advertisements are nearly identical to radio advertisements. Potential viewers tune them out or turn the channel (or fast forward, as they can now with DVR), you have to pay a significant amount in order to reach viewers on every channel, as well as pay thousands simply to produce the commercial. Bench advertisements cost a fraction of television ads and even less to produce, are always on display, and ensure that no one can change the channel. Most of the above comparisons represent "traditional" branding methods – most of which have fallen considerably out of favor. But what about internet marketing? How do bench ads compare to online marketing and branding? Requires regular content additions and constant monitoring. High competition for limited spots in search engines. Difficulty targeting local customers without costly pay-per-click methods. Regular updates to adapt for coding changes and search engine algorithm updates. These days, internet marketing is still useful. But being useful doesn't mean it compares to bench advertising. Bench branding still represents the best option for a limited budget. Bench advertising is simply the pinnacle of cost efficient branding, and the only reason people choose alternate marketing methods is because of a lack of awareness. Bench advertising appears to be the most cost effective form of marketing available - both on paper and in results – and those that utilize it regularly experience a substantial ROI.